Acadian Genealogy Homepage; Historical information on Acadians! The word Acadia has been interpreted by many historians to mean "fertile land, or rich pastures". Some of the early explorers, Samuel de Champlain for example, during the early seventeenth century on their voyages to the regions of Nova Scotia, New Brunswick and Maine (lands bordering on the Bay of Fundy), referred to the area as Acadia. For this reason, Samuel de Champlain born in 1567 in Brouage France, may well be considered the "Father of Acadians" since, during his explorations Samuel, along with Sieur de Mont, established what is now known as the first Acadian settlement on the North American continent, under the French flag. This first settlement was established on the Isle-of-St.-Croix, at St. Croix River near Calais Maine. These people, who were selected by the French authorities, are said to have been highly skilled craftsmen and farmers. This choice was made in an effort to make the colony as self-sufficient as possible, thus ensuring the success of the settlement. After experiencing harsh winters and extreme cold on this small island, they moved their settlement into the rich agricultural area of the Bay of Fundy, which subsequently became known as Acadia. Because of Acadia's strategic location between the French colony of Canada and the Massachusetts and New England colonies, the Acadians occupied an enviable position between two great European powers, France and England. The French colony of Port Royal established in 1605, was exchanged back and forth between France and England on a number of occasions. By the year 1632, after the signing of the treaty of St. Germain-en-Laye, other settlers continued to arrive to the area. Records of 1668, indicate the presence of one PIERRE CYR. 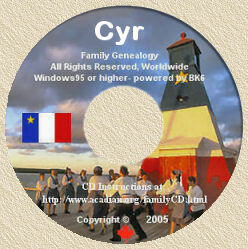 Two years after his arrival to the colony, in 1670, when the population of Acadia was recorded as being 441 souls, PIERRE CYR married the seventeen year old Marie Bourgeois and the couple started the line of CYR, which can be traced to our present-day Cyrs. The first Port Royal Acadian census of 1671 lists PIERRE SIRE as owning eleven cattle and six sheep. His only son (in 1671) is listed in the census as being three months old. 2.VERRAZZANO THEORY: It is rumoured that the Italian Explorer, Giovanni da Verrazzane, sailing from France in 1524 was the first known European to coin the term Acadia or Arcadia. The name came to him from one of two possible sources. One would be his meetings with a native who used the word "quoddy" or "cadie" to describe what Verrazzano understood to be the territory surrounding them. The second possible origin of the word would be from Greek or Roman classics, where the word Arcadia is used to describe a pastoral paradise. Verrazzano, impressed with the beauty of his surroundings, may have seen this beautiful land and called it Arcadia"... after the idyllic mythical land! 4. RADDALL'S THEORY: In July 2003, Mike Campbell offered yet another possible origin. Apparently in Thomas Raddall's "Warden of the North" (his classic history of Halifax, N.S. ), he mentions... "All Mi'kmaq place names were descriptive, and so the suffix of ak-a-de ("place of") occurred frequently. This deceived the early French explorers, who considered it the name of the country and marked it "Acadie" on their maps." Raddall doesn't mention his own source for this info, but it seems at least to be a reasonable possibility since there are still placenames in Nova Scotia with the "acadie" suffix, such as Shubenacadie, and Tracadie (also in N.B.). The area where Halifax now stands was called something like Goo-ow-acadie. 5. ZACHARY RICHARD'S THEORY: (from Zachary's email received October 29, 2007): "Le pays de mes ancêtres étaient connu sous le nom de Cadie aussi bien quAcadie. Sous Henri IV on lécrivait Cadie. Le mot apparaît sur les cartes italiennes du 16e siècle. On ne sait pas son origine. On pense que cest en référence à lArcadie de la Grèce antique. Ou bien du mot Mikmaq « algatiq » qui veut dire « lieu de campement » ou bien du lAbénaki « quoddy » qui veut dire « terre fertile ». Peu importe, le peuple sappelait « Cadien ». Avec la création des instituions acadiennes du Nouveau-Brunswick (drapeau acadien, hymne national, etc.) de la fin de la 19e siècle, plus dun siècle après la déportation, les Acadiens du nord (provinces maritimes du Canada), par le biais de lélite ecclésiastique, ont opté définitivement pour le mot Acadien." The area comprising today's New Brunswick and Nova Scotia, was once known as "ACADIA". The first Frenchmen arrived at Port Royal (present-day Annapolis Royal), in 1605. Settlement continued until the early 1700's when, in 1713, ACADIA was given to the British. Although a large majority of Acadians were exiled from Nova Scotia between 1755 and 1759 (Le Grand Dérangement), many escaped to New Brunswick and remained in the more remote areas of that part of ACADIA. From there, many traveled back to France, or settled in Quebec. In 1785, many ACADIANS immigrated to Louisiana where they became known as CAJUNS. A few weeks later, September 16, this choice was officially approved by the Catholic Bishops of the Maritime Provinces by the following proclamation: "The Bishops of the Ecclesiastic Province of Halifax declare that the feast of the Assumption of the Blessed Mary is to be the National Feast Day of the Acadians." At this same convention, Our Lady was chosen as the Patron Saint of the Acadian people. This was also to be approved officially, although many years later. Early in 1938, Archbishop Arthur Melanson of Moncton asked the Holy Father, Pope Pius XI, to ratify the choice that the Acadians had made of the Blessed Virgin to be their Patron Saint in heaven. A few days later, January 19, the Vatican issued the following proclamation: "The Holy Father gladly approves that all Acadians, wherever they might be, honor and venerate the Blessed Virgin Mary, in her Assumption into heaven, as their special Patroness, entrusting them all to the care and to the protection of such a Great Mother, so that they may preserve faithfully the Catholic faith and show it in their way of life." When it came to choose a national flag, the choice fell on the Red, White and Blue of France, with a golden star in the azure or blue of the flag. The French Tricolor was chosen to underline the French origin of the Acadian people. The star stands for the "Star of the Sea," a title which is given Our Lady, wha had been chosen as Patroness of the Acadians, who lived mostly of the sea. The star was placed in the blue stripe of the flag, as blue is, among the colors of the rainbow, the one attributed to the Blessed Virgin. The star is of gold, to show the veneration of the Acadians towards the Holy Father, whose heraldic color and metal is yellow gold. After this choice had been made, it was proper that the national anthem to be chosen should be the hymn dedicated to Our Lady, whose first words are: "Hail, Star of the Sea." It comes from an old Latin church hymn, that used to be sung in the form of a Gregorian chant. Even now, most of the time, it is still sung at celebrations with its Latin words and in its Gregorian form: "Ave maris stella, Dei mater alma, atque semper virgo, Felix caeli porta" -- "Hail Star of the Sea, Mother of God, Always a Virgin, Happy portal of Heaven!" 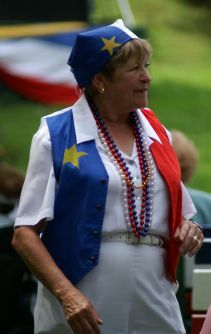 And thus, since those days of the two first conventions or congresses of the Acadians, they have celebrated their national Feast on the 15th of August, have flown as their emblem the French Tricolor with the golden star, and have made known their devotion to the Blessed Virgin by singing at their festivities their National Anthem, the "Ave, maris stella."